Last year I conducted an advocacy effort within the diabetes community live-tweeting a day of diabetes thoughts and actions. I chronicled the results of that effort here on Symplur. Efforts like #dayofdiabetes are an excellent opportunity to educate the uninformed and hopefully recruit new advocates to the right side of awareness and empathy with respect to living with diabetes. But there are plenty of other thriving chronic disease communities engaging with the world on social media platforms – what about them? Lucky for us, two such communities have embarked on their own live-tweeting campaigns: cystic fibrosis (#cf1day) and rheumatoid arthritis (#chroniclife). What do these live-tweeting communities look like? What can we learn from these advocacy efforts? Big picture, all three of these campaigns were highly effective. 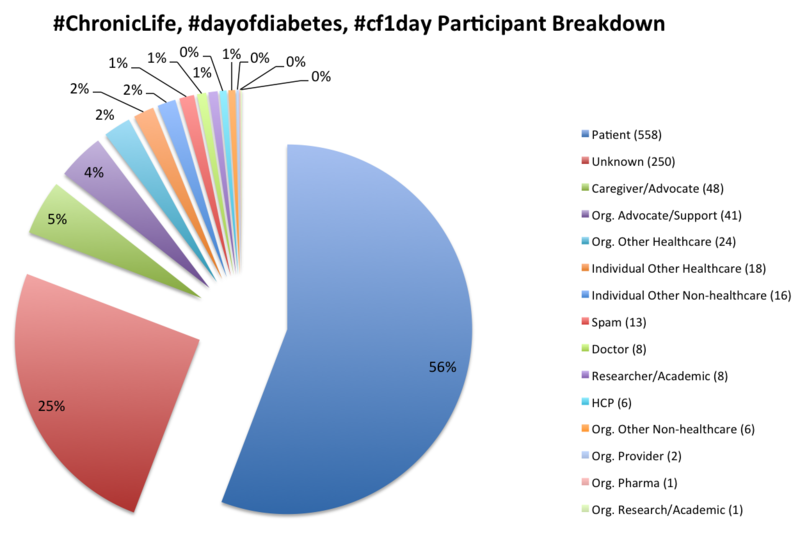 The most recent #dayofdiabetes took place on Wednesday, April 15, generating 5,349,262 impressions from 362 people. Britt Johnson (@HurtBlogger) started the #ChronicLife hashtag by live-tweeting 48 hours of her life with rheumatoid arthritis, culminating in 4,831,954 impressions from Monday, February 2 through Wednesday, February 4. Since then that hashtag continues to see regular use among patient communities managing chronic pain in one form or another, amassing 35,879,288 impressions from 3,305 users since its inception through Sunday, May 24. And then there’s #cf1day. You can read about the specifics of what Susannah Fox and Erin Moore collaborated to accomplish on Susannah’s blog to get an idea of what this exercise in empathy involved. Between Susannah and Erin, and the other participants in this effort created by the team at Smart Patients, #cf1day has generated 1,747,261 impressions since it was first used on Tuesday, March 24 through Sunday, May 24. The data gets particularly interesting when we look at the Healthcare Categories assigned in Symplur Signals. I took a look at the combined participation of all three hashtags in all of 2015 – 43,785,615 impressions, 28,363 tweets, 3,873 total participants – in an attempt to identify patients from providers from organizations from everywhere else in the healthcare spectrum. The graph below represents the top 1,000 participants, all of whom registered at least three tweets with one of these three hashtags, representing 25.8% of total participants. Of all the Twitter activity, I felt 1,000 would provide a sufficient balance of high and not-as-high activity. So we’re clear, participation doesn’t necessarily mean a full day of live-tweeting. It means interacting. It means asking questions. It means curiosity. It means empathy. I’ve said this before, both publicly and privately, but when it comes to awareness campaigns like #dayofdiabetes, #cf1day, or #ChronicLife, we need to change our perspective on what all of these numbers mean. Impressions are no longer just a metric to help determine reach and resonance, they are teachable moments. Each and every one of those tweets is an opportunity for someone to grasp, if only for an instant, what it takes to live with these diseases. Once we understand that, the question then becomes a matter of qualitative measurement. How might we truly measure how much of an impact these campaigns make? Is it in new Twitter followers? Is there an increase in relevant tweet chat participants that can be credited to these campaigns? Are there new people being “open” about their own chronic diseases? How do you measure empathy, on Twitter? How can you tell if stigma is being erased because of a hashtag? Disclosure: I am a paid consultant at Smart Patients. I did not participate in the creation of the #cf1day campaign. I was not asked by Smart Patients to include their campaign in this post. I just think it’s really cool. All of the data supporting this post can be found in this Dropbox folder.